In Hungary, this hot stretch of summer in which the city empties and not much happens is known as cucumber season. The markets, of course, are also full of small, bumpy cucumbers. With the cucumbers, bunches of half-dried dill are sold, much stronger than the standard variety, with thick stalks and flowers. Many of cucumbers will get stuffed into three-liter jars with the dill (and sometimes garlic), covered with salty water, and topped with a piece of stale bread. The jars will be set in the sun on window sills or terraces in the city, or in the grass of a countryside garden. 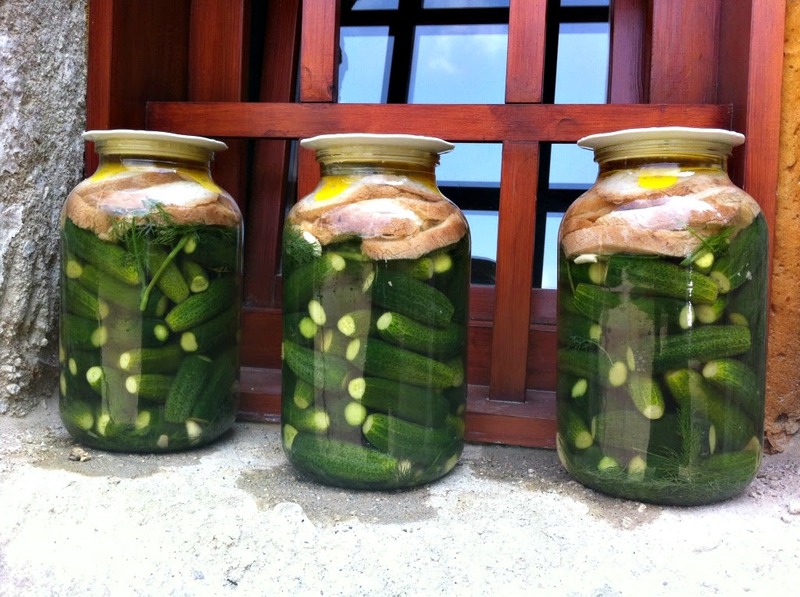 The yeast in the bread helps preserve the cucumbers through the process of lactic acid fermentation (the same process used for creating kimchi and sauerkraut). After about three days, they will be ready. The pickles should still be slightly crunchy with a sour bite. They are often served with meat dishes, or just eaten on their own. I love them sliced and eaten with bread and good házi butter. My mother-in-law claims that the juice is super-healthy, and in the old days, it was added to wine to make a sort of spritzer. Be sure to eat these with a few days since they don’t keep as long as regular pickles. You can also make a delicious chilled soup from them, kovászosuborka leves, which is perfect for hot summer days. In a clean jar, arrange the gherkins upright, fairly tightly-packed, in the jar. Add the dill stalks and garlic, if using. Meanwhile, add the salt and sugar to a pot of lukewarm water, using two tablespoons of salt for every one liter (approximately one quart) of water. Pour the water over the cucumbers, ensuring that all of them are covered. Place the bread on top, and cover with a plate or a loosely-secured lid (some air should be allowed in). Place the jar in a warm spot, but not under strong direct sun. After the second day test to see how the pickles are doing. They should be ready after three or four days when you should transfer them to smaller jars and store in the refrigerator. Note: Be sure the cucumbers are fresh (one bitter one could ruin the batch). If the cucumbers are thick, slit them length-wise a few times so the liquid can make better contact with the interior. I've been told that you should bring the jar inside during the night in case it gets chilly out, which could slow the fermentation process. Lying low at the foot of the Árpád híd, Kórház utcai Market is a vital and yet lesser-known part of Budapest's ingrained market culture.